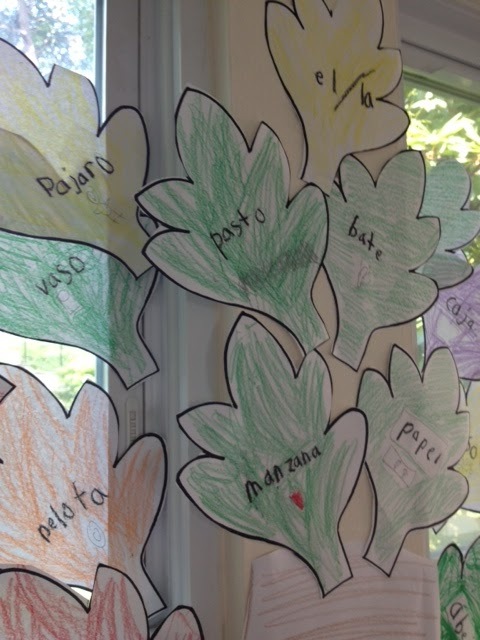 We hope you caught last week's post on introducing creative writing to kids in any language! As promised, here is the final project that the book, Rocket Writes a Story, by Tad Hills, inspired my six year-old to write his own-in Spanish! Just like the main character in the book, my son Diego searched for inspiration for his Spanish word "tree". Although his tree was up and done for a few days, once he was ready to start his story, he realized his word tree had to grow some more. 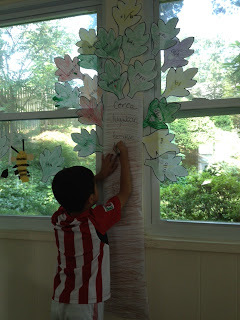 I was happy to help him express his thoughts in Spanish, help him add words to the wall and let his imagination go! The lines on his paper had to be perfectly straight! Hmmm, reminds me of someone I know. ja! 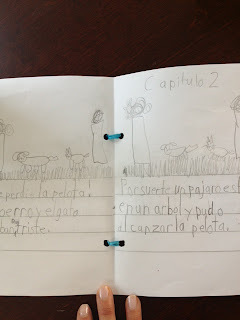 Because Diego understands Spanish a lot more than he speaks it, he had a little trouble translating on to paper what he wanted his story to say. 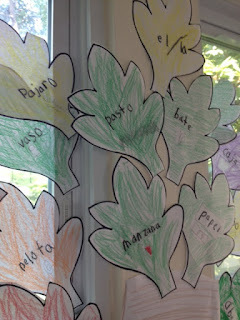 His traditional classroom has many word walls and I knew he was already in the habit of looking around the room for help in spelling or coming up with "juicy" words. 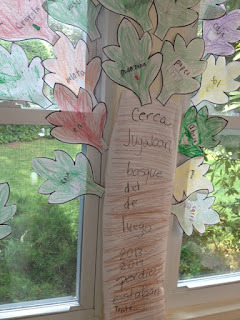 As you can see, we added more Spanish words to the tree. It was so rewarding to see his eyes light up when he realized everything he thought in English, could be written in Spanish! Diego wrote his first Spanish book (two chapters and six pages long) and boy, was he proud! He read it to his grandmother and to his father as soon as he walked in the door. He also kept saying that he had enough, "subjects" on his tree to write another story soon. This Spanish word tree isn't going anywhere for a while! 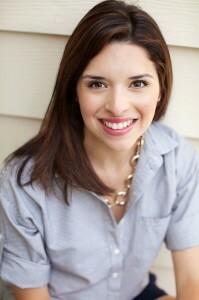 Creative writing can be frustrating (I know it, first hand!) so make time to be available if kids need to process their thoughts with you. Writing in the child's minority language will be hard but not impossible. They should be encouraged to write simple sentences at any age and any language. Take small steps. Notice we did this project by reading a book first, then writing single words, reading the book again, creating an "art project" and then finally writing a story. Once the book is in development, encourage your child to look back at their story to see if they have used a word they need again. Not only do they have the word wall as a reference point, but now a new source as well. Writing is just as important as reading for academic success. An early start is so beneficial. 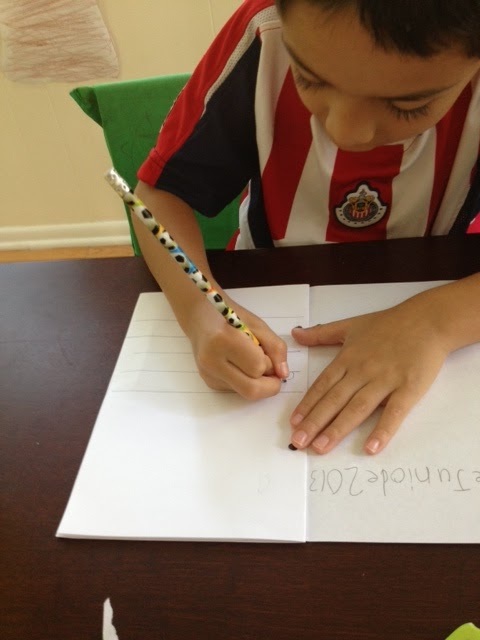 Keep your summer occupied by asking your child to tell you a really good story-on paper.